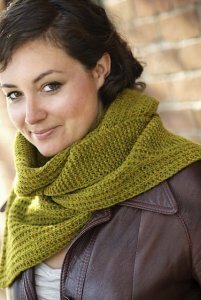 One of Jared Floods stunning scarf designs available to knit in several of our favorite worsted weight yarns! Size US 8 needles (or size needed to obtain gauge) are required but not included. Finished Measurements: 8" X 78" after blocking. Gauge: 18 sts and 36 rows over 4" in garter st.
Yarn Shown is Brooklyn Tweed Shelter. Unfortunately we are not carrying this yarn at this time. Please see the kit options below for several other lovely options. $21.00 -- Kit price including yarn only (no book or pattern).